A Borboleta Pequena da Couve tem três ou mais gerações por ano. A fêmea deposita os ovos isoladamente na face inferior das folhas de Brassicas sp. e mostardas. As lagartas escolhem os rebentos mais tenros completando o seu desenvolvimento no espaço de um mês. A crisálida é formada agarrada a muros e sebes. Três semanas depois as borboletas eclodem. Os individuos pertencentes à última geração do ano hibernam em crisálida e os adultos só eclodem na Primavera seguinte. 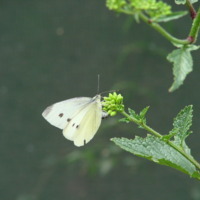 The small white has three or more generations in a year. The female deposits the eggs singly on the underside of leaves of cultivated brassicas such as cabbages and nasturtium, although wild brassicas including wild cabbage, hedge mustard and wild mignonette are also used. The caterpillars tend to feed on the hearts of cabbages, not on the outer leaves. They are solitary and are fully grown after one month. They then undergo pupation, the pupa is attached either to the foodplant or to fences and other structures. Adults emerge from the pupae of the first generation after roughly three weeks, but the pupae belonging to the last generation in the year overwinter, with adults emerging the following spring. Adriana Galveias (fotógrafo), “Ovos de Borboleta Pequena da Couve,” MUHNAC Digital, accessed April 19, 2019, http://digital.museus.ul.pt/items/show/161.